Home » Does Student Loan Debt Affect Getting A Mortgage? Last year, I helped answer a reader’s question about applying for a mortgage while on Income Based Repayment. 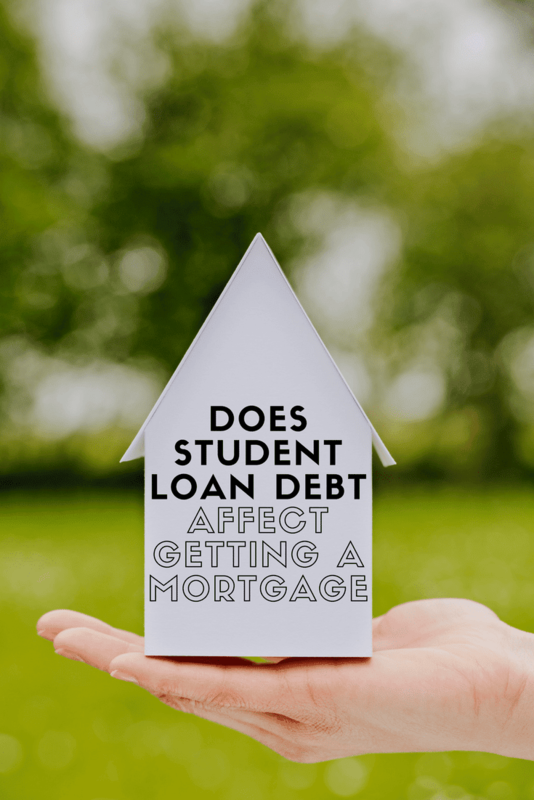 However, over the last several months, I’ve been getting bombarded with questions about how student loan debt impacts your ability to get a mortgage. Maybe it’s because the housing market is improving, or maybe it’s because people are finally taking their student loan debt seriously. Anyway, I wanted to share a few reader questions and then look at whether student loan debt affects getting a mortgage. I have $27,000 in student loan debt and it’s currently in deferment for another month (since I just graduated). I’m looking to buy my first house and I was wondering how these loans would impact my ability to get a mortgage? – Jennifer S.
I was thinking about buying a home because I’m worried about rising home prices and not being able to afford one later. However, I’m currently paying over $500 per month on my student loans. I’m worried the bank won’t approve me for a mortgage. What do I need to do to qualify to buy a house? – John P.
My husband has student loans that he is working to get forgiven because of his military service. However, they won’t be fully paid off for another 3 years. We are looking to buy a house in his next duty station this year, but were concerned how these loans would show up on our credit report. Can we still get a VA loan or FHA loan when we have student loan debt? – Sarah M.
So let’s talk about it – can you buy a house or get a mortgage when you have student loans? Does student loan debt affect getting a mortgage? If you want to know – you can get a mortgage with student loan debt. You just have to follow some rules. We recommend using LendingTree to compare mortgage lenders and find one that will qualify you. Learn more here. For your credit score (and credit history), lenders typically want to see scores above 750. This means that you’ve made all of your payments on time and have a good history of using credit. When they look at your credit report, they don’t want to see late payments, collections, or a bankruptcy. The same rules apply to your student loans. If you want to get a mortgage, you just want to make sure that you’re always paying your student loan on time. Deferments and loan forgiveness don’t count and won’t count against your credit score. However, forbearance will negatively impact your credit score. If your loan is in forbearance, it is reported to the credit bureaus as “non-paying”, and it can significantly impact your credit score. This doesn’t mean that lenders won’t mess up. If you read my story about FedLoan Servicing, you’ll realize that student loan servicing companies mess up often. That’s why I urge you to check your credit score for free using Credit Karma. They will also let you know exactly what is wrong so that you can go fix it. They have tools (like form letters) that you can use to send to companies like FedLoan and get them to correct inaccuracies in your report. This is another area where your student loan debt could impact your ability to get a mortgage. If your total debt payment (mortgage + student loans + other debts) exceeds 36% of your income, your lender will probably not approve you for a mortgage. One way to potentially reduce your monthly student loan payment amount (and as a result your total debt to income ratio) is to refinance your student loans. If you can refinance your student loans to either a lower interest rate or longer repayment term, you’ll likely be reducing your monthly payment. To learn about your student loan refinancing options, check out Credible, a free marketplace for student loans where you can receive offers from multiple lenders after filling out a single form. College Investor readers can get a $200 bonus when they refinance with Credible. Finally, most lenders will look at your employment and employment history because they want to know where the money is coming from to pay your bills. Lenders typically want you to be at your job for at least one year before they will consider the income – but some lenders want 2 years or even 5 years in the same industry. Otherwise, they may be leery about including that income and you could not get a mortgage. This aspect of getting a loan is especially tough for recent graduates. You may want to buy a house, but you may be disqualified simply because you haven’t worked in a job long enough. Jennifer S.: Most likely won’t be able to get a mortgage because she doesn’t have enough employment history. The bottom line is that student loans alone don’t prevent you from getting a mortgage. It’s your total credit history, which student loans are a part of. If you’ve been responsible with all of your debt (student loans included), you should have no trouble getting a mortgage. However, if you’re already struggling with student loan debt, you’re probably not ready (and won’t get approved) for a mortgage. Do you know someone who has struggled with student loan debt and wanted to buy a house? My cousin has a student loan before, but still he managed to purchase a house. He has a good income and he has a good credit score. So for me, I don’t think having a student loan could affect getting a mortgage. This article is incorrect. I have a median credit score of 786. I have been constantly employed full time since finishing my undergrad even through completion of my MSW. I have been with my current employer for 2 years and in my field for 5. I have 53,000 in student debt up from the 44,000 I actually borrowed. I am enrolled in IBR for PSLFA. I have never had a late payment on my loans and have autowithdrawl. I went through the process to get a mortgage and was denied at closing for my student loans. The kicker is it was a federal home loan program on a federal repayment plan.